A couple of days ago I noticed the first few digits, and made a mental note to look out for the full string. I can’t concentrate on driving if I’m busy looking at the numbers; it’s bad enough keeping an eye on my speed dial and in all the mirrors and out of the side windows and on the SatNag at the SAME TIME as watching where I’m going, figuring out which lane is likely to go where (we have some roads with 5 lanes of traffic in each direction), and changing gear, braking and just generally driving… So I stuck to checking while waiting for the lights to change. There was absolutely no chance of me taking a picture while still moving :). Yesterday I drove home from work through the middle of Berlin. That was obviously a pretty stupid decision. But hey. Who doesn’t make stupid decisions sometimes? Berlin is chocker-block-full during rush hour(s). What takes me approximately 55 minutes on the train, took me almost 2 hours with the car. There are a million traffic lights between where I work and where I live. 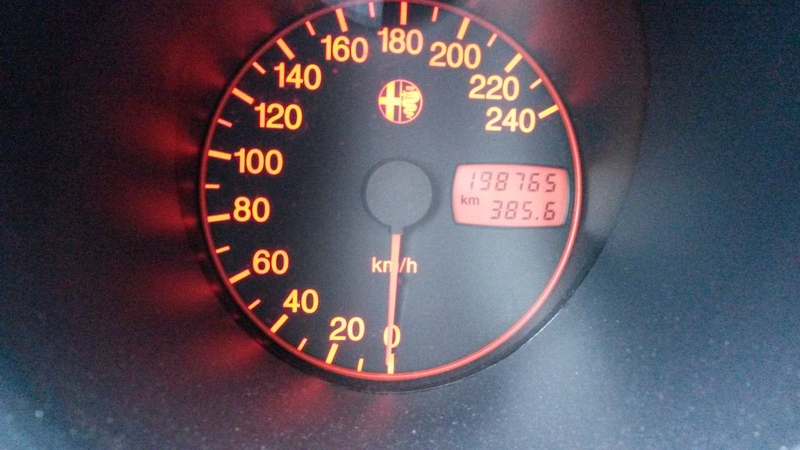 I checked the kilometerage at every set of red lights. Just as it started getting close to my number, there was a ‘grüne Welle*’ – every light was green as I drove up to it. On any other day that would be awesome. And unlikely. Yesterday it was more annoying than anything else. Finally, my luck changed and I reached a red light while it was still red. I took my photo and the light changed to green. 400m later the moment and the number were gone. It wouldn’t have mattered to anyone or anything else if I’d missed it, but I would still have been sad, if I hadn’t had the chance to appreciate it. Yup! Isn’t that a fantastic thing?! Can you imagine a world without any serendipitous moments? ?